I don't remember when it started, only that my legs and feet hurt--occasionally at first, then more frequently, then all the time. I could barely walk. Then, it was my wing. I was losing my feathers. Then the tumor appeared. It wasn't a big deal at first--at least I didn't think so. Just a little bump, an ugly little bump. But it grew, and it grew fast. "What is this thing?" I wondered aloud. "It's cancer," Sam One said with a gravity in his voice that I found unsettling. I swallowed hard. "Am I going to die?" I asked. I couldn't take it all in. "How soon?" I wanted to know. "Come on--I need to know!" I pressured him. "A few months," he said finally. "A few months? It's not fair!" I cried. "Hey...you got twenty-one years," he reminded me. "That's far more than most of us get." I realized how that must have sounded to him. "Sorry." "I would have liked more than nine years," he confided. "I don't know why I had to leave. Yes, I was jealous of Collin at first...but that would have passed. He's a pretty terrific big bro." "Yeah, he is," I agreed. "You have family on the other side, too," Sam One reminded me. "Some you haven't met yet, like Scamp and Red." He looked at me. "There's another kind?" He shook his head. "This one was a little red hen who was a companion of Mom's when she was a little girl," he said. "You'll like her." I was quiet for a little while. "Are you okay?" Sam One asked. "I'm dying," I said. "What do you think?" "So...we all go to Heaven?" I asked. "Of course," Sam One answered. "We didn't screw up the way humans did. We didn't eat that apple--we didn't even nibble on the core when Eve threw it down." "We?" I asked. "You were there?" He gave me a light whack with his wing. "You know what I mean--we as in birds!" "Ah...that we," I said, nodding. "We didn't even nibble on the discarded core," he said. "Some of us abide by the rules!" "They're supposed to be the smart ones, but really...when the Great Flood came, the humans didn't take Noah seriously. The rest of us were all in line with our boarding passes." Very poignant, and very fitting with the inner voice of both birds. Thanks, William! I just wrote all of the animals and birds according to their personalities--and they each had very distinct personalities. Sam One was with me when I was a teenager. My parents got him for me for Christmas after my dog Scamp died. They thought another dog so soon might be a bad idea. Boarding passes!! How creative and sweet. This is great. I think most people dealing with love, loss, and family will be able to relate. Very smart story. I hope so, Carole. The last two scenes were difficult to write, yet I felt an odd sense of relief. I don't want to read the ending! I always cry! I did...and yet I felt like the two of them were there with me when I wrote it, like it came from somewhere outside me. I am crying as always. The ending has a message, Gayle. I think you'll like it. 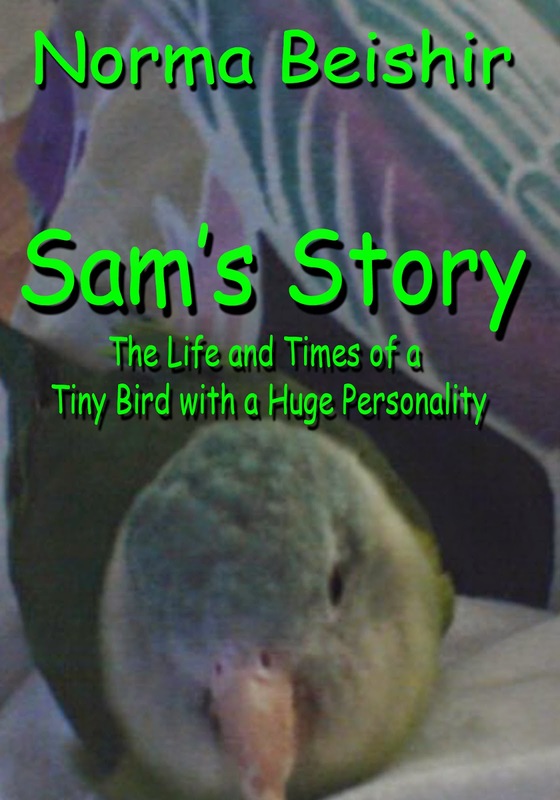 When Sam Too was with us, he used to behave as if there were someone else in the room with us. Sometimes he was very happy to see whoever it was, but other times he was angry and afraid. One night, about 20 years ago, he woke me in the middle of the night, screaming as if he were being attacked. I checked him over once I calmed him down. I checked every inch of the cage. I found nothing. But something terrified him. He wouldn't go back in the cage until morning. Loved the "boarding passes," That is classic. It was just something I thought of, imagining how orderly the animals had boarded the Ark. This is adorable. And yes, birds and animals are much smarter than some of us humans. Yep. God just let us think we were smarter because He felt sorry for us. So sad of situation about which you wrote, yet adorable of they who you'd written, hon. :) Glad that writing this helped you have a sense of relief. Hugs.